I received this lamp yesterday. Coming from Mexico it was pretty fast shipping. The item is exactly as pictured on the internet, and it's beautifully made. I have yet to hang it and plug it in, but it's clear that it will provide a lovely glow. This is perfect for the small space I have that won't accommodate a floor lamp or table lamp, yet it doesn't require hard wiring, and can be plugged in. This is a very good buy. It came well-packaged, and it's just beautiful. 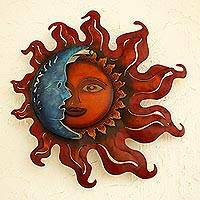 I have collected all of J. Blas sun and moon metal art. I love every piece. 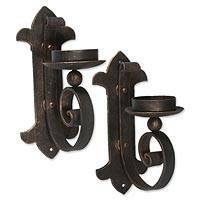 I have them mounted on my inner backyard fence with lights on each one so they make a great presentation at night as well as during the day. 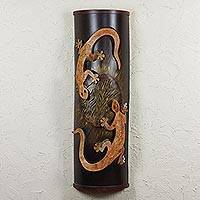 Artisan Crafted Steel Lizard Wall Sconce, "Gecko Encounter"
Glowing color distinguishes this beautiful metal wall sconce by J. Blas. Bathed in sunlight, friendly geckos meet in the Mexican tropics. The switch is located on the cord. 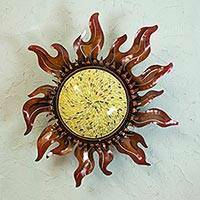 Iron wall lamp, "Majestic Mexican Sun"
Working with sheets of metal, J. Blas depicts the sun's golden rays in high relief. 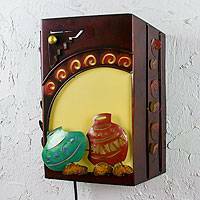 This colorful hand painted sculpture is designed as a beautiful wall sconce. The switch is located on the cord. 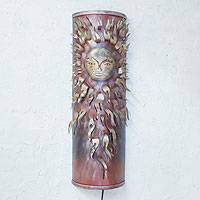 Bring light into your home with NOVICA's Wall Sconce collection. Each piece is delicately handcrafted by some of the most talented artisans worldwide. Please enjoy! Sconces are arguably the easiest and most inexpensive way to spruce up a wall. Our Wall Sconce collection features pieces made in Mexico, West Africa and India. 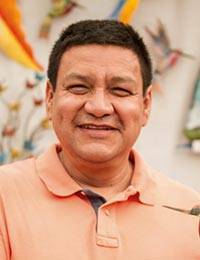 Featured artist Marco Polo Serrano was born in a small town and comes from a family of artisans. By the age of 13, he got a job at a workshop that designed intricate ironwork. 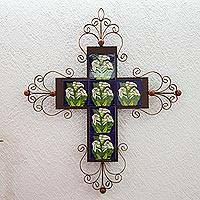 Sconce artist Byron Toscano became passionate about wrought ironwork at a young age. At 16, he began working for a well known Antigua forge for seven years. 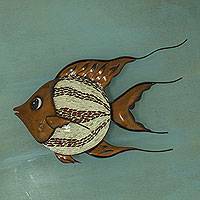 There he learned techniques, designs, and finishes for wall sconces and other pieces. After all these years Toscano has held onto the first piece he made, a miniature lamp.